A fun six hour tour of Alaska, with food, dog sledding and gorgeous views. CHECK FOR Real Alaska Tour BY DATE! 11:05 a.m. to 5:15 p.m. Schedule is designed to work with the 11:05 am - 6:00 pm Alaska Railroad schedule. Are you looking for the best Seward Alaska tours out there? Well, this tour is a great way to see Seward in a day, especially for those without transportation. First, take in the fascinating history and breathtaking beauty as your guide shows you the sights of Seward Alaska, known as “the Gateway to Alaska” and “Mile 0″ of the Iditarod Trail. See first-hand the effects of the 1964 Earthquake and stand in awe of the mountain that is home to the second oldest foot race in the United States. 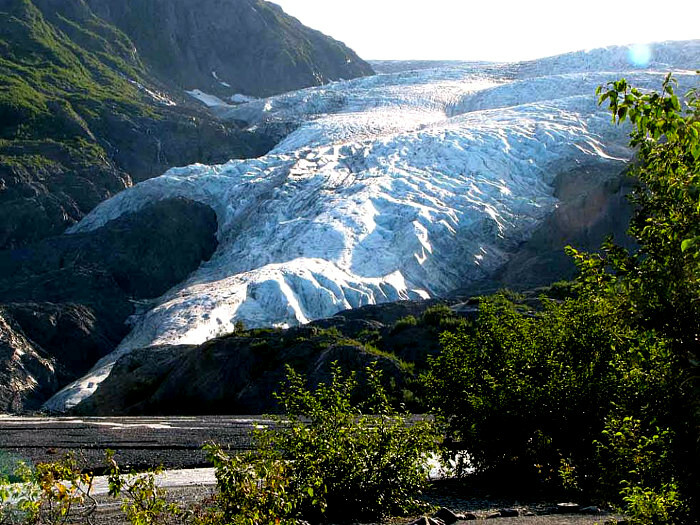 Then, head out to Exit Glacier in the Kenai Fjords National Park one of Seward Alaska's favorite views. A short walk along the nature trail takes you to the face of the glacial ice. Watch for mountain goats, moose or bear on the mountainside. During the salmon runs, see salmon swimming upstream to spawn. A hearty lunch will be served at nearby Resurrection Roadhouse before you travel to the Seavey homestead and experience IdidaRide’s 1.5 hour Wilderness Dog Sled Ride and Tour. At the end of this fun-filled day, your driver will return you to your hotel, cruise ship or the Alaska Railroad depot. Seward tour is fully guided by a long-time Alaskan, and all expenses are included. Can you give me an overview of the Real Alaska Tour? 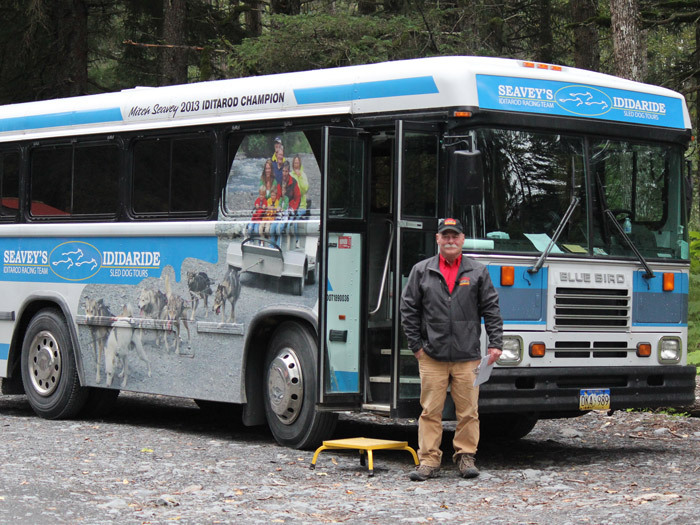 The Real Alaska Tour starts at the Seward Alaska train station at 11:30 a.m. It includes the Alaska Dog Sled Ride and Tour, then continues to lunch at the Resurrection Roadhouse. After lunch, we'll explore Exit Glacier in the Kenai Fjords National Park where you go for a short walk right to the face of the glacier, then to Bear Creek Weir to see the salmon spawning and jumping up a little waterfall. Next we'll head into town for a short Seward tour before returning to your hotel/train/ship. Tour includes all meals, transportation, entrance fees, etc. What time does this Seward Alaska tour start? The train gets to town at 11:05, and we try to get everyone aboard and start by 11:30. The tour ends at 5:15-5:30 at the train station, or we’ll drop you off at any area hotel or the cruise ship terminal. Will I make it to my train? Yes. Most passengers on this tour will be on the same train, and we’ve never missed the train. Even if we were late, we’re one of the train’s official tours so they won’t leave without us. If you are getting off the train and going on a cruise ship we recommend checking it at the cruise ship. If you’re getting off a cruise ship and taking the train, we recommend checking your luggage at the train station. Exit Glacier Guides (across the street from the train station) also has a luggage locker you can use. I’m coming in on the cruise ship and leaving on the train, how do I get there and what do I do with my luggage? The train station lets you check in starting at 10:00am, so we recommend taking a cab or shuttle there with your luggage in the morning, check your baggage, get your boarding pass, and meet our bus there. That way you won’t have to deal with your luggage throughout the day. Come directly to our kennel on Exit Glacier Road; just be here by 11:30am. We have plenty of parking for motor homes, and a drive through parking lot so you won’t have to turn around. 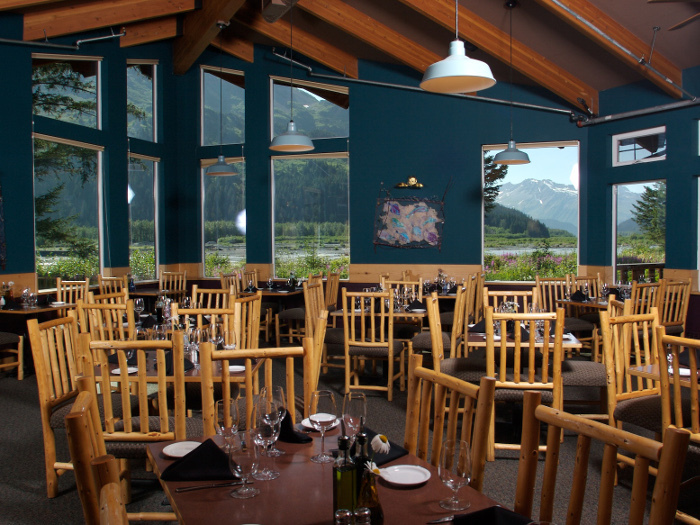 We pick up at the Seward Windsong Lodge, between 11:20-11:40, but that’s it. All other hotel guests must meet at the railroad depot. Does this tour spend more time with the dogs? 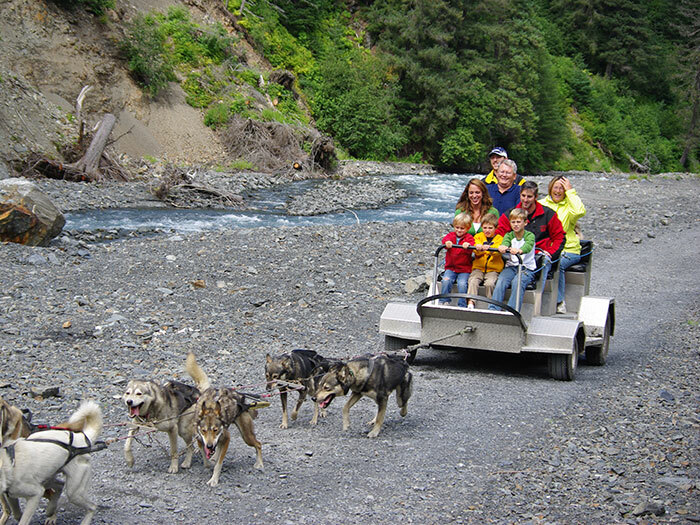 The dog sledding portion of the tours is the same, the Real Alaska tour continues on from there by coach. There will be several options of hardy Alaska fare available, so you’ll be sure to find something that you’ll like. How long of a walk is it to Exit Glacier? The walk to Exit Glacier takes about an hour over moderate terrain. If, for any reason, you do not want to do the hike you may stay in the Kenai Fjords National Park Nature Center. You will still be afforded excellent views of Exit Glacier on the drive in. Do we get to walk on the glacier? No. You will not be walking on the glacier. We will, however, be walking up to the glacier. We often see wildlife such as bears and moose, especially while out at Exit Glacier. Wildlife, however, is wild. We cannot control when we will see it nor can we guarantee that it will be seen. Can I drive myself to these places? No. 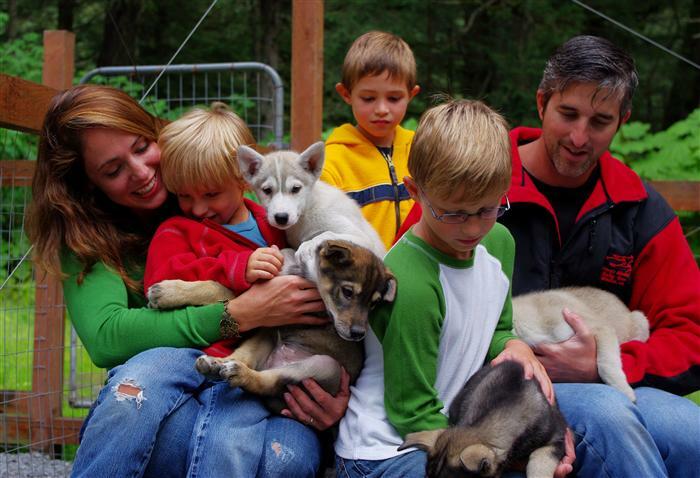 If you have your own vehicle we recommend parking it at IdidaRide Sled Dog Tours for the day. We recommend dressing in layers and a raincoat (if you bring it you won’t need it!) as it allows the most flexibility.